Do you feel like eating when your stomach is upset? No, of course not! You lose your appetite, and sometimes it takes days before you feel like eating again. Your dog feels the same way, and enticing him to eat with these chicken and rice cakes may help to jump start his appetite. When your dog isn't feeling well, kibble probably won't be enough to entice him to eat. Using whole, natural foods is a great way to tempt him into eating something. 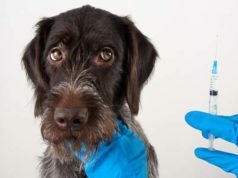 Protein sources, like chicken and other meats, usually have powerful odors that lure your pet. 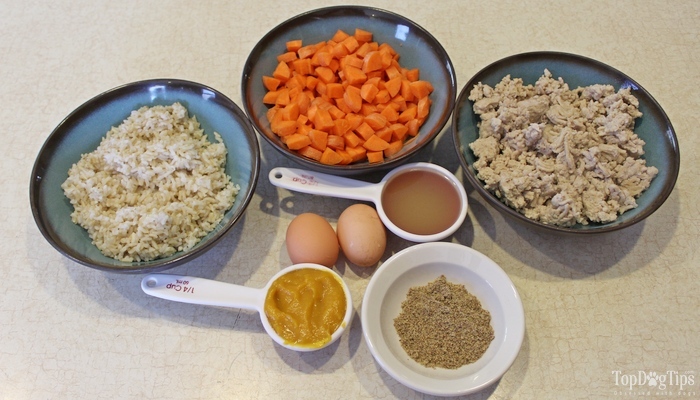 These chicken and rice cakes can also be used to add nutrients to your dog's everyday diet. You can use them as treats or break them into small pieces and use it as a food topper. This is a quick and easy way to add proteins, vitamins and minerals to your dog's daily diet. Before you begin putting this recipe together, you'll need to do a bit of prep work. First, cook the ground chicken thoroughly in a skillet. I use the tablespoon of coconut oil to keep it from sticking. You could also use olive oil if you don't have coconut oil on hand. While the chicken is cooking, crack the eggs into a bowl and drop the shells in too. Break the shells into small pieces with a fork and then scramble the eggs and shells together. Leaving the shells in with the eggs is a quick and easy way to add calcium to your pet's diet. When the chicken is thoroughly cooked, add the egg mixture to the skillet and cook until the eggs are done. Now, put 1/4 of this chicken mixture into a food processor. Add about 2 tablespoons of the carrots, 1/3 cup of the cooked rice and the chicken broth to the food processor and blend until it becomes a pureé. In a large mixing bowl, combine the pureé, the rest of the chicken mixture, the rest of the rice, carrots, squash and flaxseed. Cover a cookie sheet with parchment paper, and spoon out round portions of the mixture onto the paper. As I mention in my video guide, the serving size for this recipe is about 1/2 cup for every 20 pounds of weight. If you want to use this recipe as a full meal, I would recommend measuring out the mixture and making each portion equal to 1/2 cup. That way it will be easy to feed your dog his daily meals. You'll need to let the chicken and rice cakes cool before serving, as this will allow them to set and form patties. You can store leftovers in an airtight container in the refrigerator for about 5 days. You can also freeze the leftovers in an airtight container, and they'll keep for about 2-3 months.